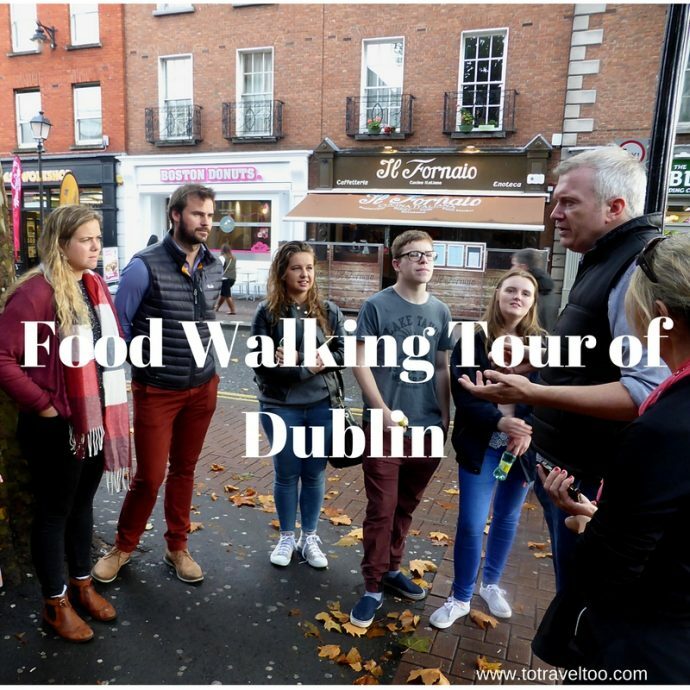 So, you are wondering what to do in Dublin, you love delicious Irish food, you love walking, why not combine the two and enjoy a Food Walking Tour of Dublin. 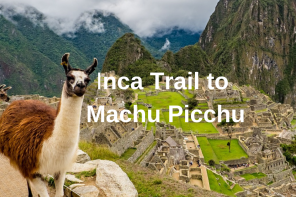 We are ‘sort of’ becoming addicted to food walking tours by locals after our first one in Cusco Peru, then subsequent others Lickrish Tours in Barbados, and Taste Porto in Porto Portugal. 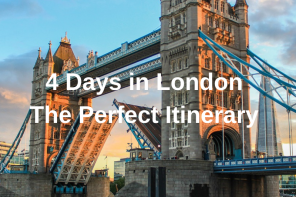 We feel the excitement of being let into the secrets of the locals on where the best places are to eat and drink that are not tourist traps, and especially where the best pubs in Dublin are. 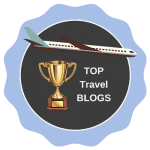 Checking out Tripadvisor, for best things to do in Dublin Ireland, Fab Food Trails came up tops so we reached out to Eveleen Coyle who is the founder and lead guide and luckily she had two spaces left for the tour on the next Saturday with their guide Chris. The meeting place at the Woollen Mills near Ha’penny Bridge was easy to find. We even had some time to explore this side of the river before meeting Chris at 10.15. We were surprised but pleased to find that local Dubliners outnumbered tourists and were exploring their own city- that was a good sign! The diet of the Irish people up until the introduction of the potato was bland and monotonous, to say the least. Their main source of protein was from milk, they grew onions, carrots, parsnips, oats, barley, fruits and berries and ate very little meat. Honey from their bees was used as sweeteners, and they brewed their own beer. For those living in the coastal areas, shellfish was a part of their diet. Sometime between 1586 and 1600, the potato arrived in Ireland, the exact date remains still unclear. Farmers could produce a good crop even if their land was of poor quality. The male diet during this time would consist of 10lbs of potatoes a day with some milk and green vegetables, now that is a lot of potatoes! Potatoes would be best cooked in the embers of their fires preserving vitamin C.
Disaster struck in 1845 when a fungus attacked the potato crop and half was lost during that first year. By the end of the famine in 1852, over one million had died from starvation and another million had left the country. Jump a hundred years or so to the 1970s and 80s Ireland was still mainly rural. The Irish Diet was mostly bacon, cabbage and potatoes on Mondays, Tuesdays, Wednesdays and Thursdays, fish on Fridays, bacon and cabbage on Saturdays and a roast chicken on Sundays. Ryanair began operations in 1985 which gave the Irish people the opportunity to travel abroad and this, in turn, changed the food scene in Dublin and Ireland. 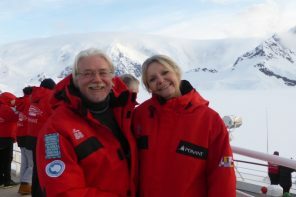 Discerning travellers longed for the cuisines that they were enjoying abroad. When the recession hit Ireland in 2008, the sale and rental of retail properties plummeted, devasting news for some but for others, a bonus as opportunities presented themselves in the availability of smaller shops which were perfect for coffee shops, small lunchtime cafes etc. Let our journey into Dublin’s fabulous foods begin with coffee, of course, it was that time of the morning and we all needed a bit of a heart starter to get us going. Wigwam is a live music venue as well as a cafe/bar selling over 100+ rums and cocktails and great coffee. Our single shot espresso hit the spot, Wigwam takes pride in their coffee blends and this morning we enjoyed a combination of beans from Guatemala and Costa Rica. Apparently one of the secret ingredients is the water, well we all know that coffee contains water, but not all coffee has the privilege of being made with the great water from the Wicklow Mountains. Yes, water does have a major impact on how coffee tastes, that was news to us! Next up was a ‘piccolo’ a baby latte. Wigwam uses local organic dairy milk from 2 dairy farmers based in Carlow, about 90km from Dublin. Steaming the milk to between 60-65 degrees increases the sweetness making a perfect ‘piccolo’, certainly by the sounds of the group, the coffees went down very well and we were well prepped for our next tasting. There is always a little of the unknown in food walking tours as you don’t really know what is next until you arrive at the front of the next venue. We love a good story and Caryna Camerino has a great one to tell, although she was not available to tell her tale herself that day. A backpacker who only was supposed to stay in Ireland for 2 days has now been in Ireland for 14 years. Working in HR in Dubin when the recession hit resulted in her having to lay people off Caryna started to bake to help relieve the pressure she was feeling. She opened a stall in a local market and added a delivery business for her brownies that she baked throughout the night. 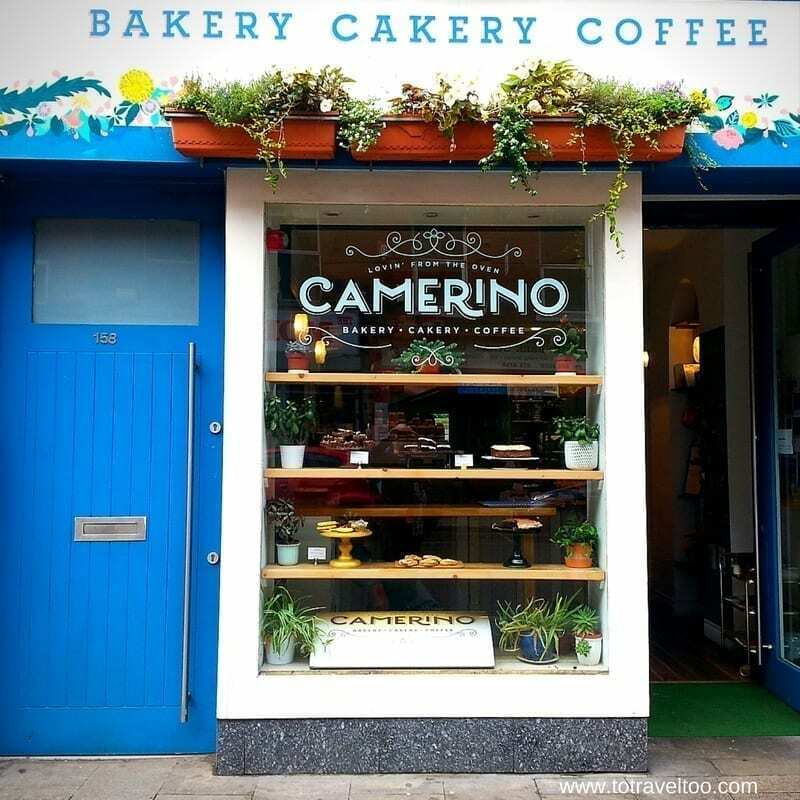 In 2014 Caryna opened up Camerino in Capel Street and has never looked back. Her earnings have doubled each year since opening and she now runs courses and is open on Sundays. Caryna now employs 10 people and has 2 bakeries. Here at Camerino the staff start their working day at 7 am and bake everything in the small oven on the premises. Freshly baked scones and jam yum! There was an enticing aroma of freshly baked scones as we entered the shop and by the look of anticipation on everyone’s face, we were hoping they were coming our way! We were not wrong! Absolutely fabulous with their homemade jam and cream! Everything is mixed by hand. Chris explains to us that the North side of the River Liffey has always been an urban working class area. New eateries are popping up everywhere, he pointed out Klaw Poke beside Camerino, a cross between Japanese sushi and Peruvian ceviche. There are now high-end cafes, Korean, Chinese and Lebanese cuisines just to name a few, Capel Street has a new lease on life offering some of the best places to eat in Dublin. Heading over the Grattan Bridge over the River Liffey to our next stop Chris took us through Dublin’s newest food store – Dollard & Co at Wellington Quay. Dollard & Co will make a mark on the Dublin food scene with its bakery, butcher, food court selling wood fire pizza and numerous restaurants. The displays of fruit and vegetables caught our eye as we wandered through. Definitely one of those stores that you could spend hours in. One of the best Dublin tourist attractions is Temple Bar. Temple Bar is always a fun part of the city to wander through and on that Saturday morning little did we know but we were headed through an archway into Meeting House Square for the Temple Bar Food Market that is held on Saturdays. 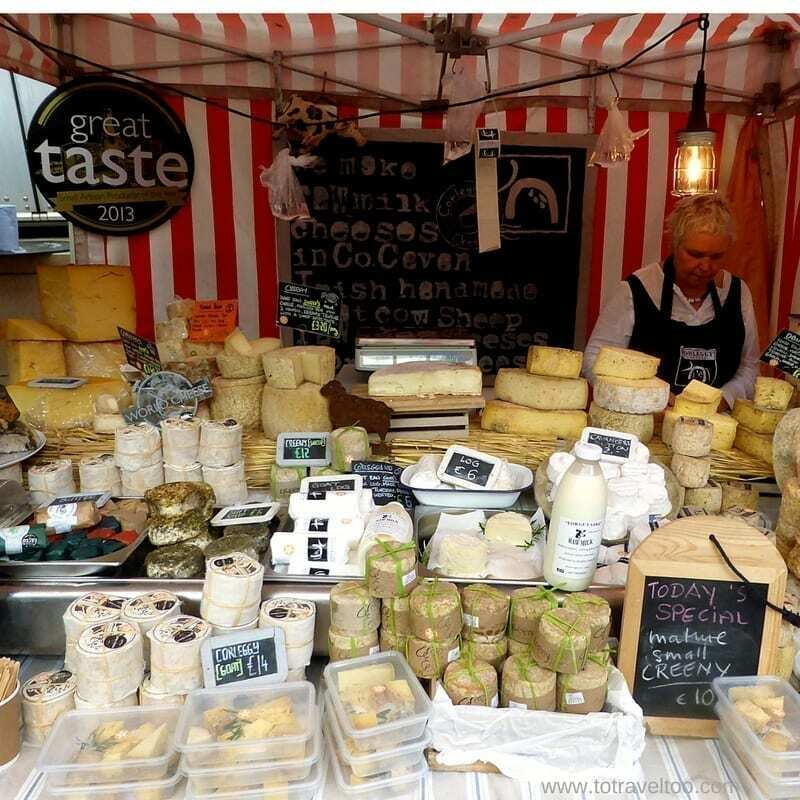 Who doesn’t love a food market especially one that showcases the best of typical Irish food. We passed stalls with all types of bread, cheeses, fruit and vegetables, food until we reached Broughgammon. Broughgammon, back in 2011, saw an opportunity in the goat industry. Male kid goats were put down at birth whilst female goats were used for milk production. It seemed a shame as goat meat is a healthier alternative to red meat, it is low in cholesterol and saturated fat as well as high in protein and iron. 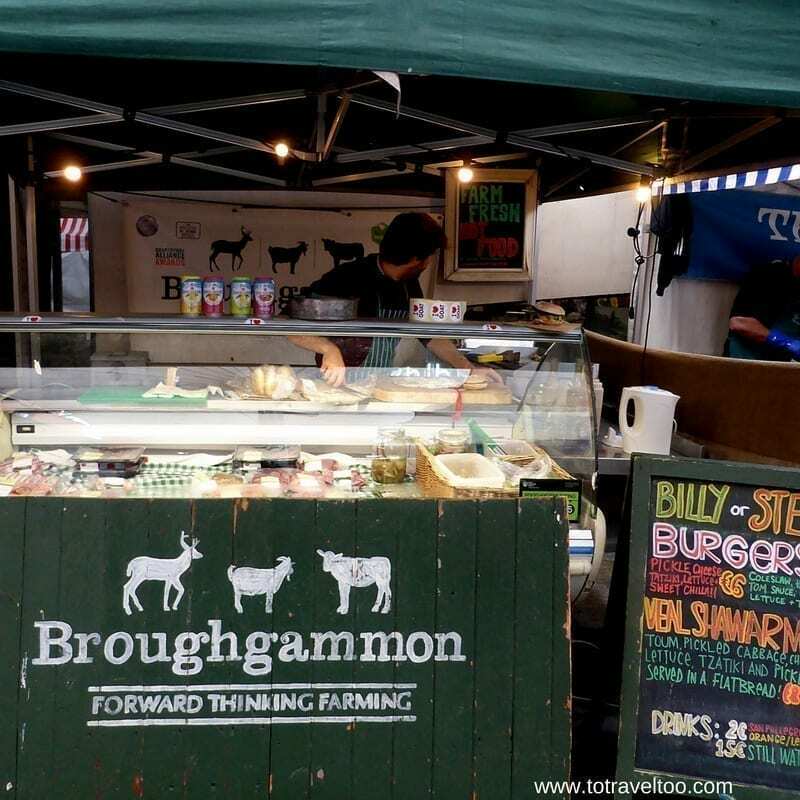 Broughgammon also specialises in free-range rose veal and seasonal wild game. They also run cookery classes, butchery and wild game classes, an artisan on-site butchery and a farm shop. Their meat can be delivered all over Ireland and the UK. In 2016 at the British Street Food Awards their goat tacos with chorizo and bacon crumb won the award for Best Snack Food. The tasting today was goat burgers, and from those who were not vegetarians, they were given the thumbs up. Address of Broughgammon Farm: 50 Straid Road, Ballycastle, Co.Antrim, BT54 6NP. 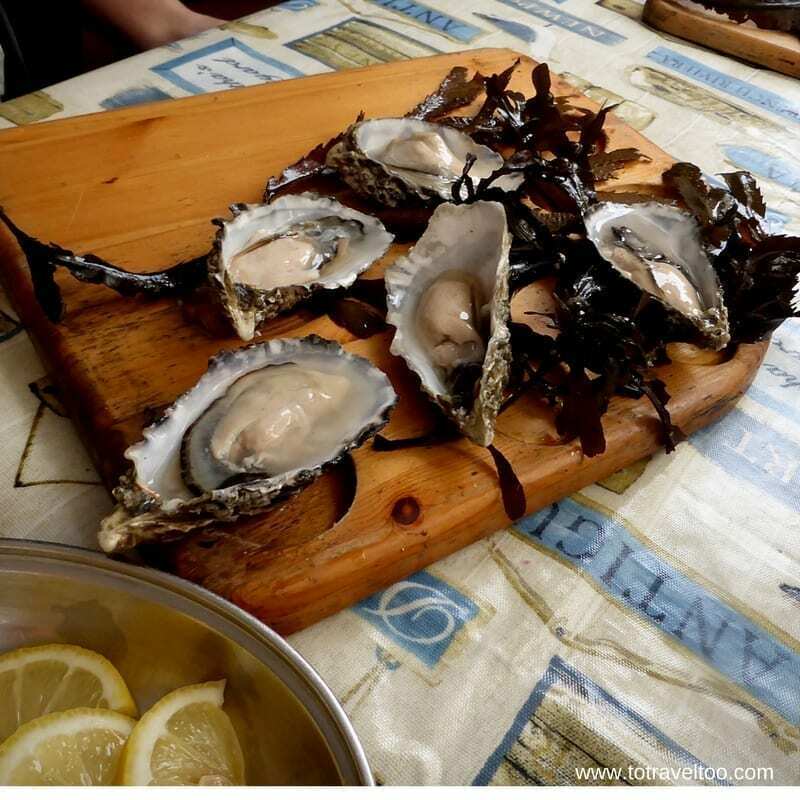 Oysters were a primary food source in Ireland for over 5,000 years confirmed by the finding of oyster shell fossils dating back to that time. You either love them or hate them! The Oyster Bar is a busy venue on a Saturday and at times you can expect to queue. On offer today was oysters with a shallot vinaigrette or tabasco and lemon with a glass of chilled white wine. For those of us who were not too keen on oysters, we relaxed with our glass of white wine and enjoyed the ambience of the market. 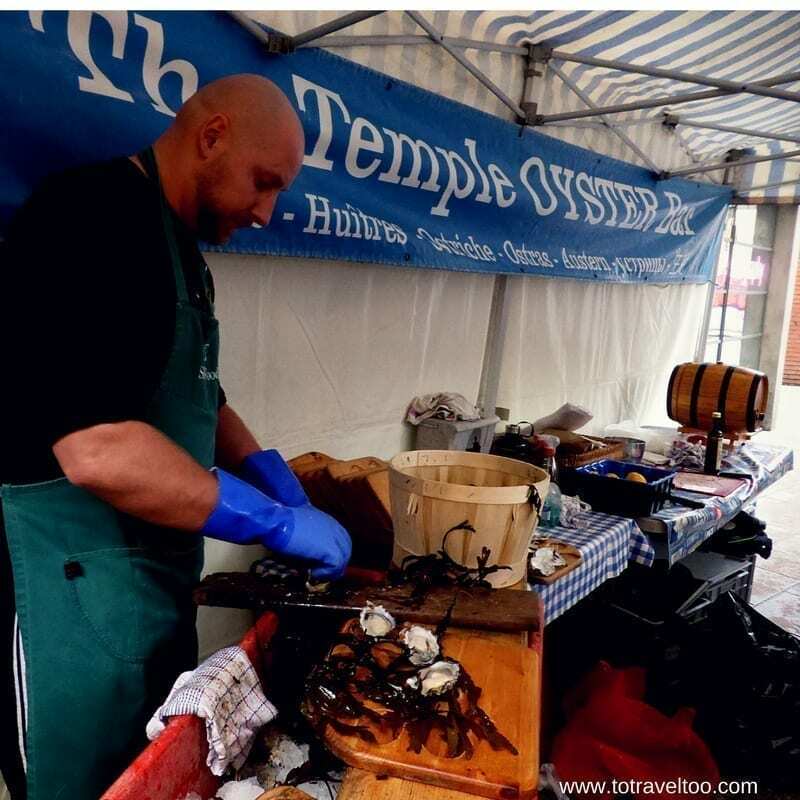 Marine biologist Stephen Kavanagh owns the Oyster Bar and loves chatting about the health benefits of oysters. They are low in calories and low in fat, a good source of protein and high in vitamins A, E, and C, zinc, iron, calcium, selenium, and vitamin B12. 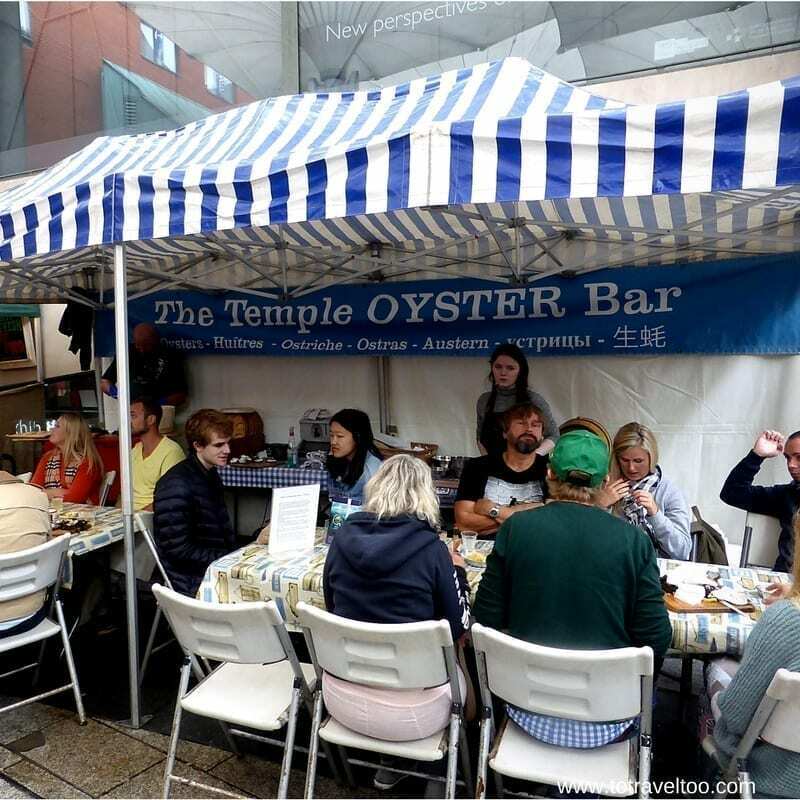 There are many food options to enjoy whilst at the Temple Bar Market. We will certainly return. Just off Grafton Street is one of Dublin’s finest examples of classic Georgian architecture – Powerscourt Townhouse once the property of Viscount Richard Wingfield and his wife during the 18th century. Powerscourt took over 3 years to build at a cost of Euros 80,000 and was designed by Robert Mack. We were visiting the Pepperpot Cafe opened by two women Dervla James & Marian Kilcoyne who were students of the famous Irish cooking school – Ballymaloe. Opening up in the middle of the Irish recession would have daunted the best of us, but these 2 gutsy women did and are extremely successful. 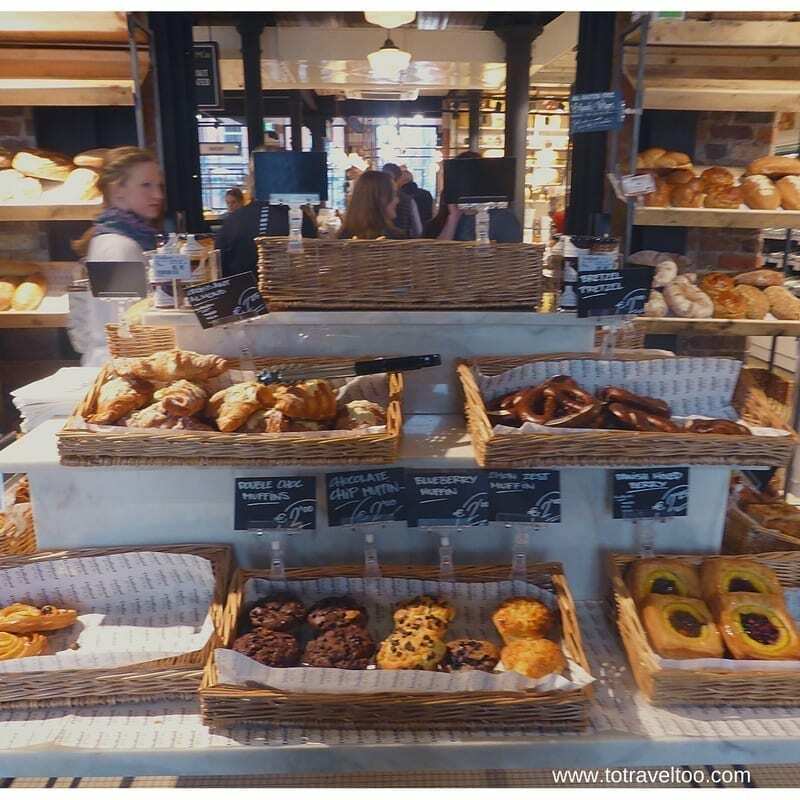 Their focus is on traditional Irish Farmhouse baking offering the customer soda bread, victoria sponges, scones and bagels that are made from scratch. 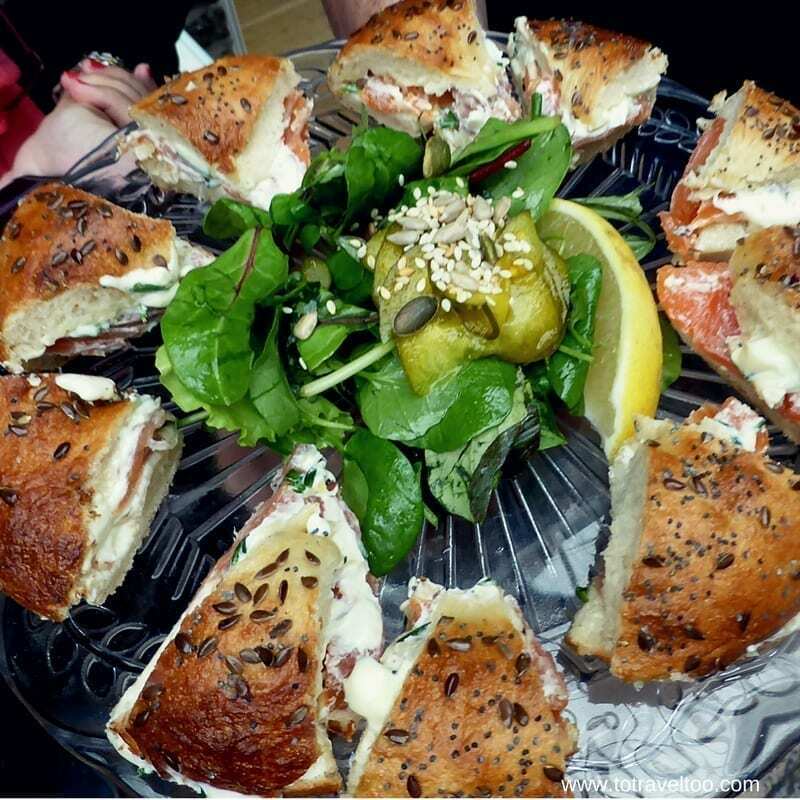 It was the bagels that we were tasting today with smoked salmon, lemon and chive cream cheese. They went down a treat! Do yourself a favour and check their menu out, you can even take home jams and chutneys and homemade bread (n.b. all bread must be ordered 1 day in advance). After coffee, scones, goat burgers, oysters, smoked salmon bagels what ones craves next is cheese! We love Lonely Planets take on Sheridan’s “If heaven were a cheese shop, this would be it.” We totally agree. The oohs and aahs from our group as we entered Sheridans in South Anne Street just off Grafton Road was enough to know that this was something special. 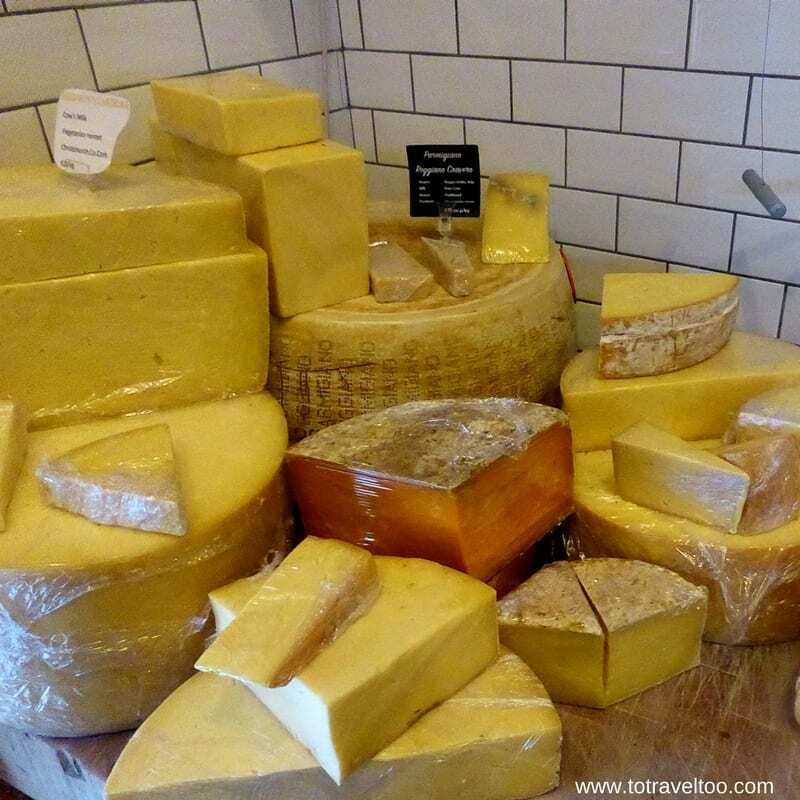 Sheridan’s is a great find for those who love cheese, with cheeses from Ireland, United Kingdom and Europe there is so much choice. 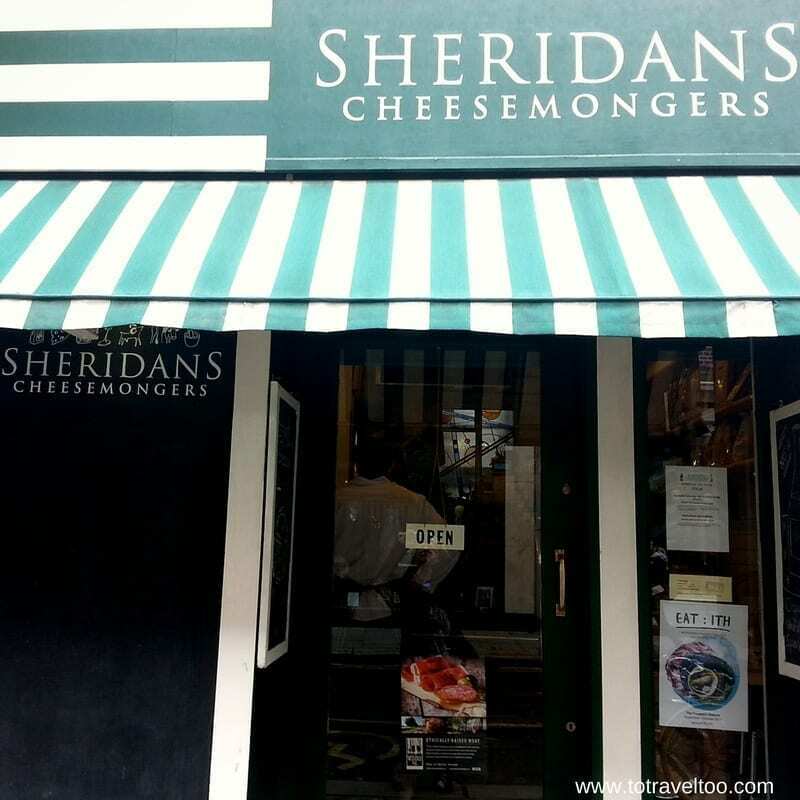 Sheridans was founded in 1995 by 2 brothers Kevin and Seamus Sheridan who started their business in Galway Market. In 1997 Fiona Corbett joined them and their business has expanded to not only Dublin and Galway but Meath and Waterford. 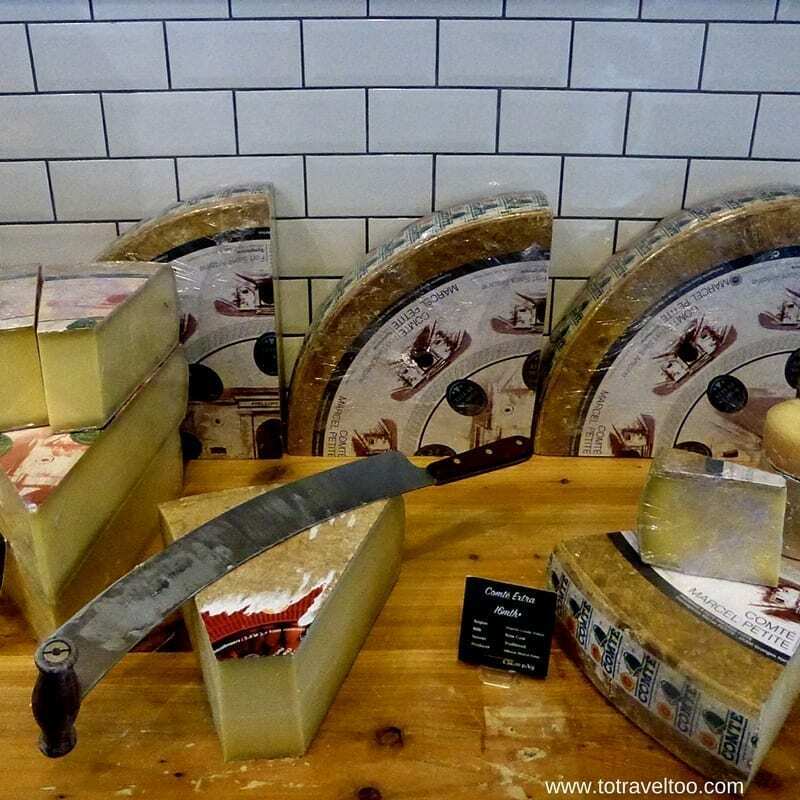 Apart from cheese, they offer a wide range of old world wines, olives, crackers, chutneys, cured meats and other delicacies. A walking tour of Dublin would not be complete without a visit to a traditional Irish pub and seeing this was our last venue it was a fitting end to an enjoyable couple of hours out and about in Dublin. 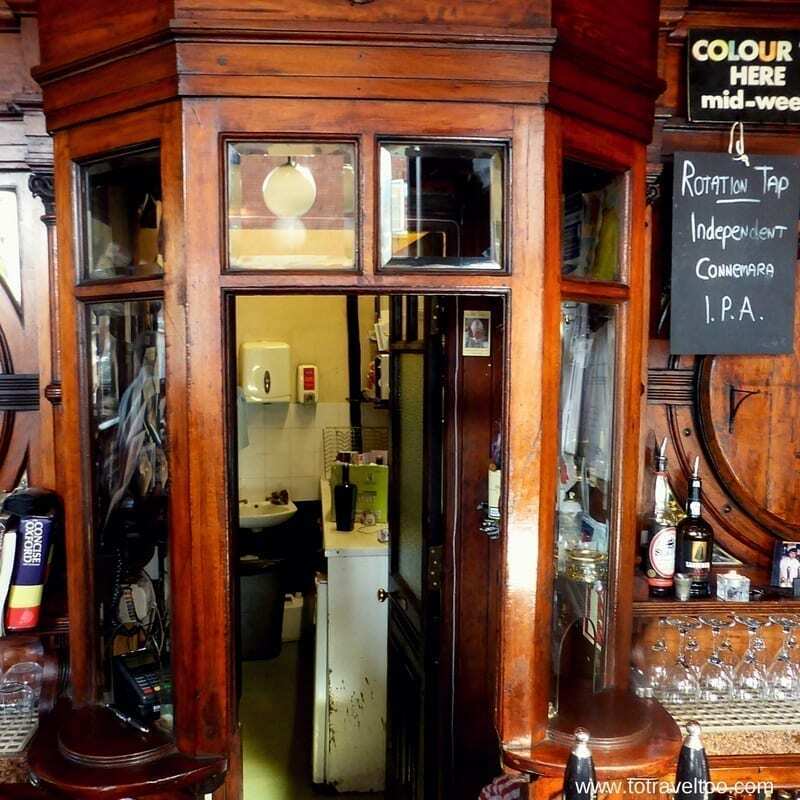 The Swan Bar in Aungier Street dates back to 1897 complete with a snug (a small private room within the pub where women would have a drink or two), the original beer pump handles and the original booth where the cashier would sit with the day’s takings. 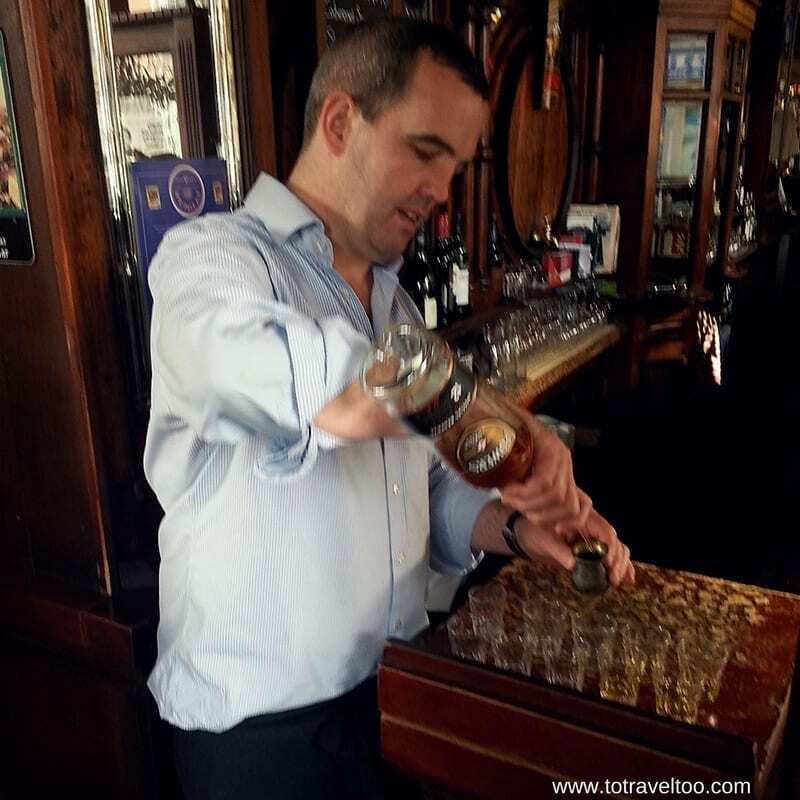 We met with Ronan Lynch, who is the third generation of Lynch’s who have worked and owned The Swan. 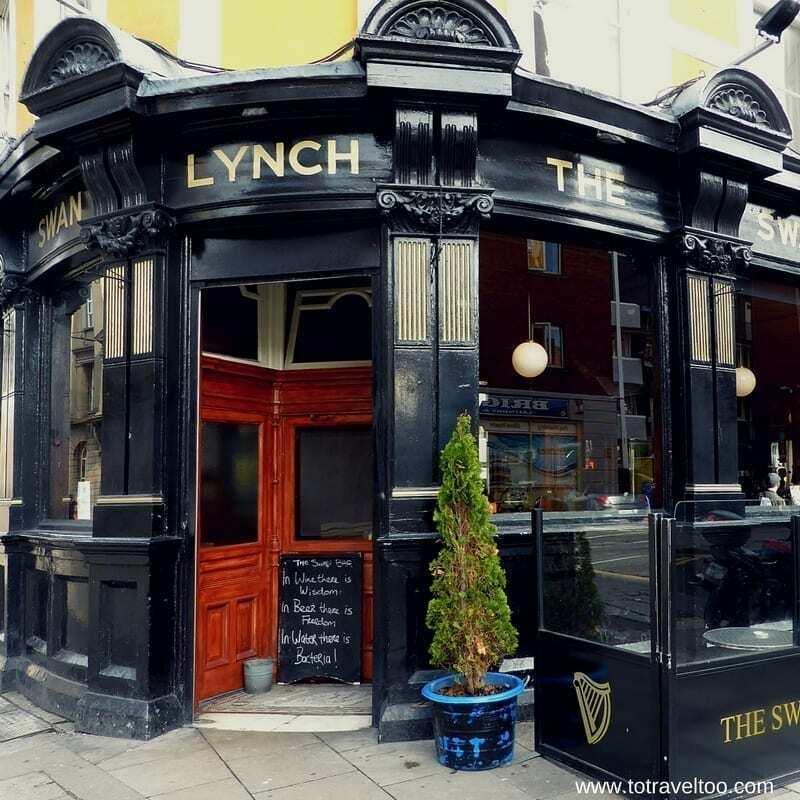 Ronan’s father is quite a figure in Dublin, not only being the publican of The Swan but the first publican to have played international rugby for Ireland. Our last tasting for the day was a taste of Powers Dublin Whiskey. Powers is made at the Midleton Distillery in County Cork and it is said ‘no other whiskey is made like Powers’. For those of us who were not whiskey drinkers we just had to give it a go. The usual whiskey ‘burn’ was not evident but a smooth full flavoured whiskey which was easy to drink and one that could become a regular ‘tipple’. 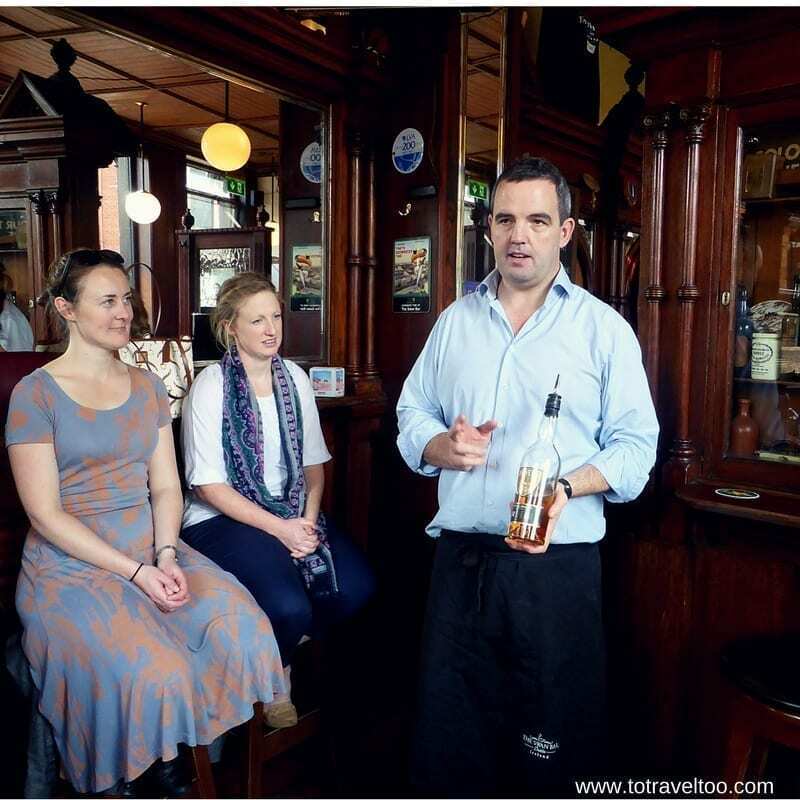 Our thanks to Eveleen for allowing us the opportunity to experience Fab Food Trails in Dublin on a complimentary basis. Our thanks also to Chris who was knowledgeable not only in the history but also in Irish cuisine and food in general. It was a pleasure to be in his company. 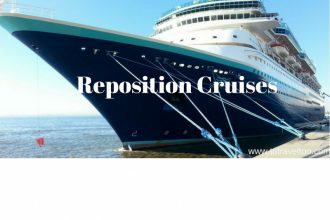 If you are looking for Dublin Tours to enjoy we can certainly recommend Fab Food Trails and on our return to Ireland we would do the tour again and ensure that we head to Cork for the Cork Food Trail. 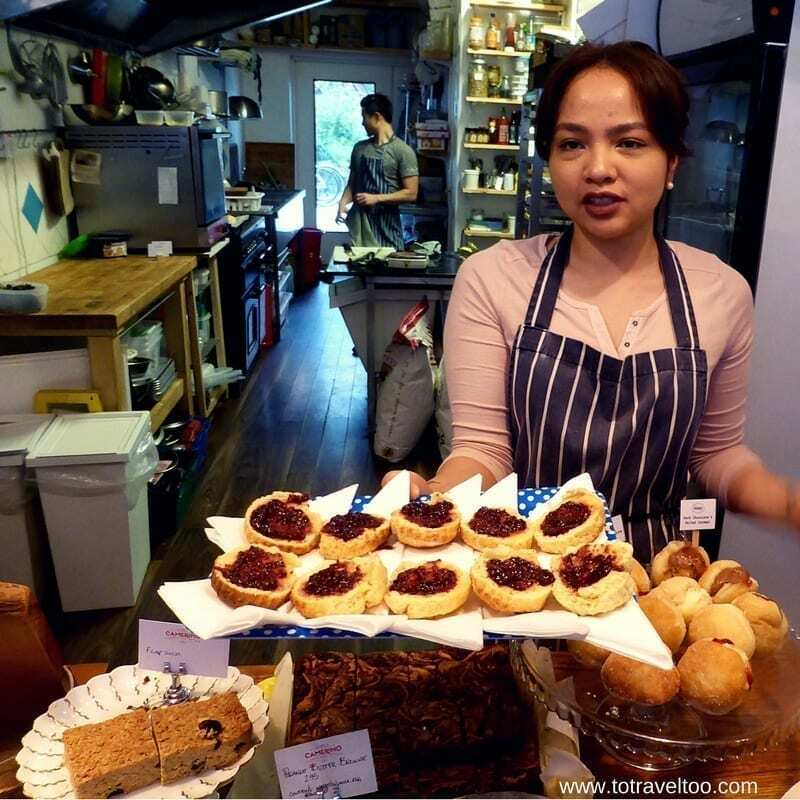 For our readers, the Fab Food Trails tour changes the venues on each of the walks. 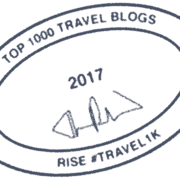 DISCLOSURE: We enjoyed this tour as guests of Fab Food Trails but received no further remuneration to write this post. We were not expected to write a positive review – all views are our own and we retain full editorial control. 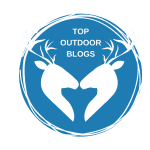 Really Nice Information for Foodo-Holics , as this Information will make them go there to visit this places , Nice Impressive Content !! Appreciated !! 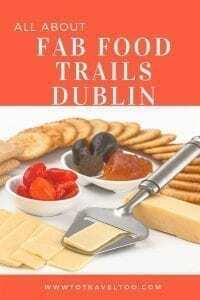 I am a foodie and love walking, plus I’ve always wanted to visit Dublin! So this is a triple threat for me! I’m also a huge fan of history, which it sounds like this tour was chocked full of. Maybe my trip will even turn out the same as Camerino’s with a few days leading to years. One can dream! Thanks for your comments. Hope you can take the tour one day, but do not eat before you go. I will walk for food! Seriously, this sounds like a great experience, especially for foodies. I would love to visit Ireland and see a real Irish pub. Thanks for your comments. Irish Pubs are such fun places, not only for the Guinness but for the locals. I do love me a food tour and am always on the look out for one wherever I go. 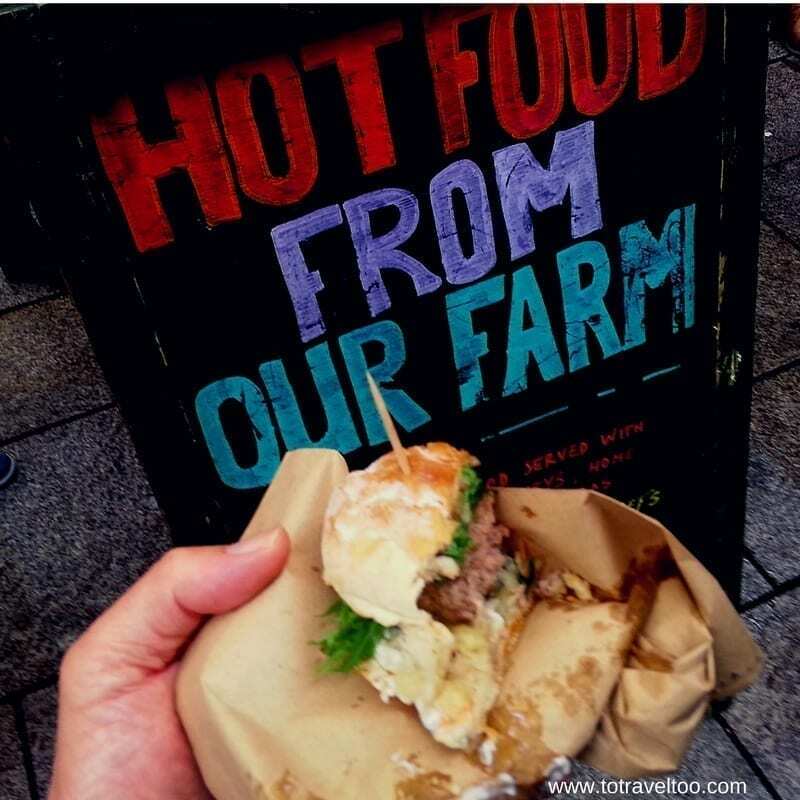 The Food Walking Tour of Dublin sounds awesome and so much fun. It does look like you go to explore a wide diversity of places. It’s so interesting to learn that the water to make the coffee in Wigwam used water from the Wicklow Mountains, which adds to making the coffee here excellent. Thanks for your comments. Hope you can get to visit Dublin one day and do the tour! I love a good food tour! 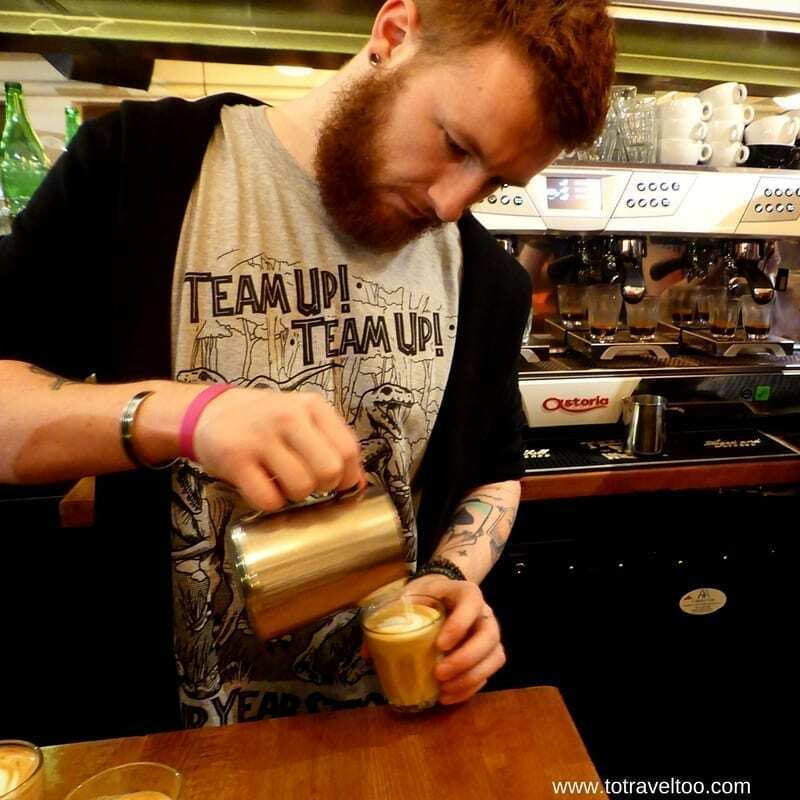 And I have yet to visit Dublin, so I’ll keep this post in mind for when I do go! I especially would love to try the oysters there. I used to hate them but now I love them and enjoy trying them all over the world! Thanks for your comments. Hope you get to enjoy oysters in Dublin. I can say Dublin has the best food tour. Every one of them makes me drooling. And the story behind Camerino is so inspiring! But most of all, even Dubliners took the food tour on their own city. 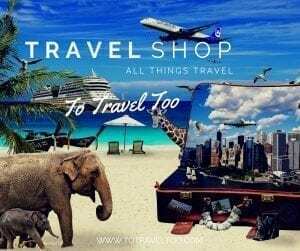 It tells how wonderful is these food tour! Thanks for your comments. Dublin is perfect for ‘foodies’ I would definitely return to do this tour again, as they do different places each tour. Those scones with jam looks delectable and lovely to pair with piccolo! How I wish to experience Dublin food tour as well. You showed us many places to dine and experience it like a local do. 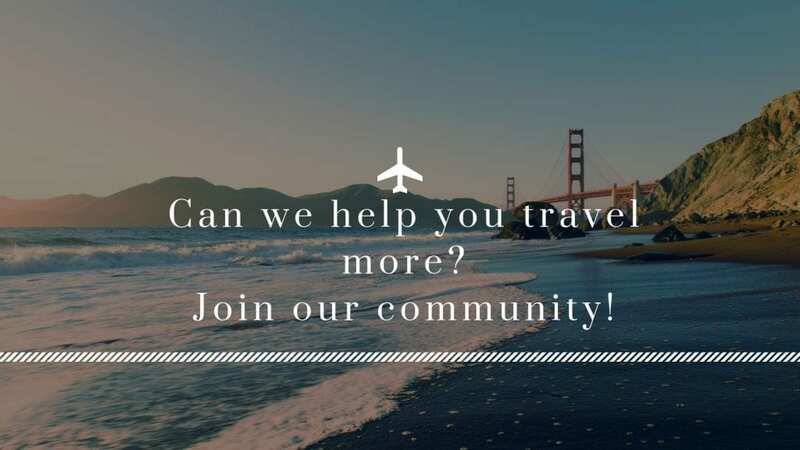 Where is your next food tour? Thanks for your comments. Our Dublin Food tour was great. Our next tour will be in Bangkok next month. 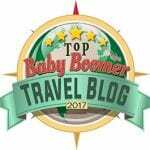 I love the idea of food tours. We had one in Japan and Thailand and it was really a wonderful experience. It was also a brilliant way of experiencing the local cuisine. 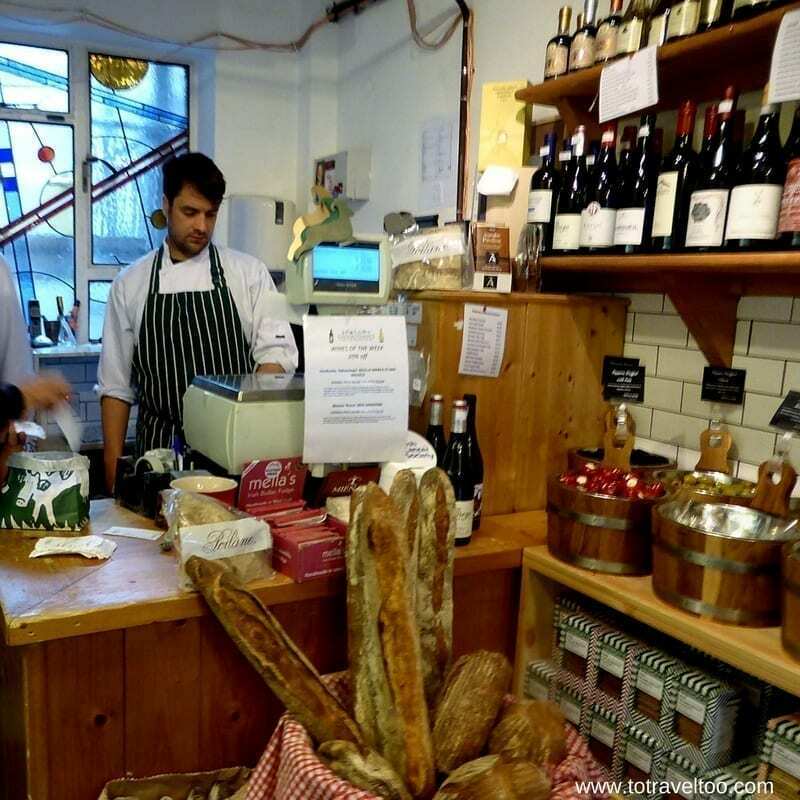 Will definitely take this food walking tour should we get a chance to visit Dublin. Thanks for your comments. 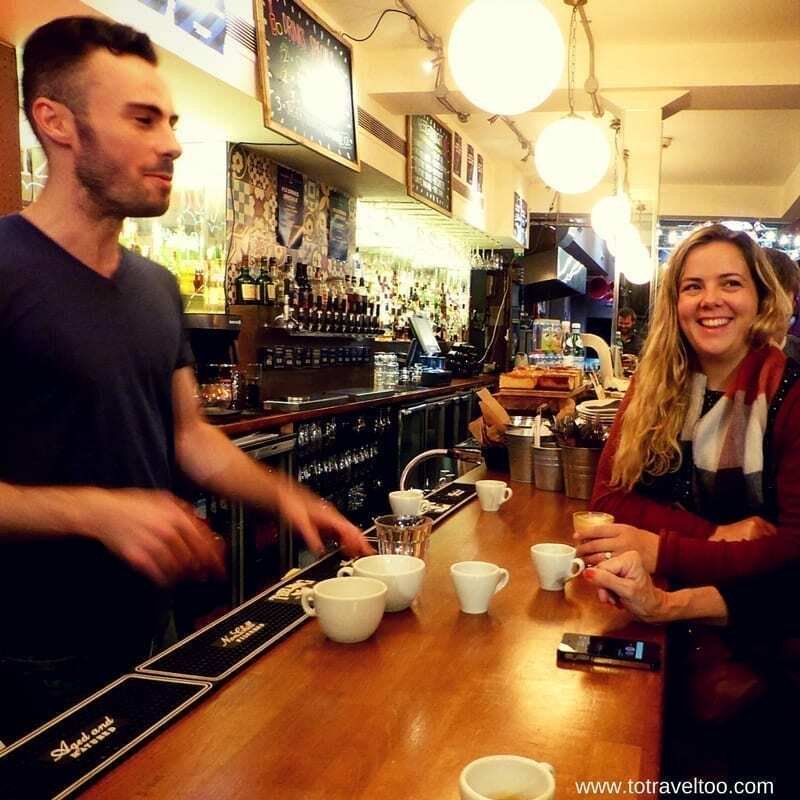 Food tours are a great way to learn about a city. Hope you get to visit Dublin. I believe the best way to get yourself introduced to a new food culture of a place is to go for a food tour. 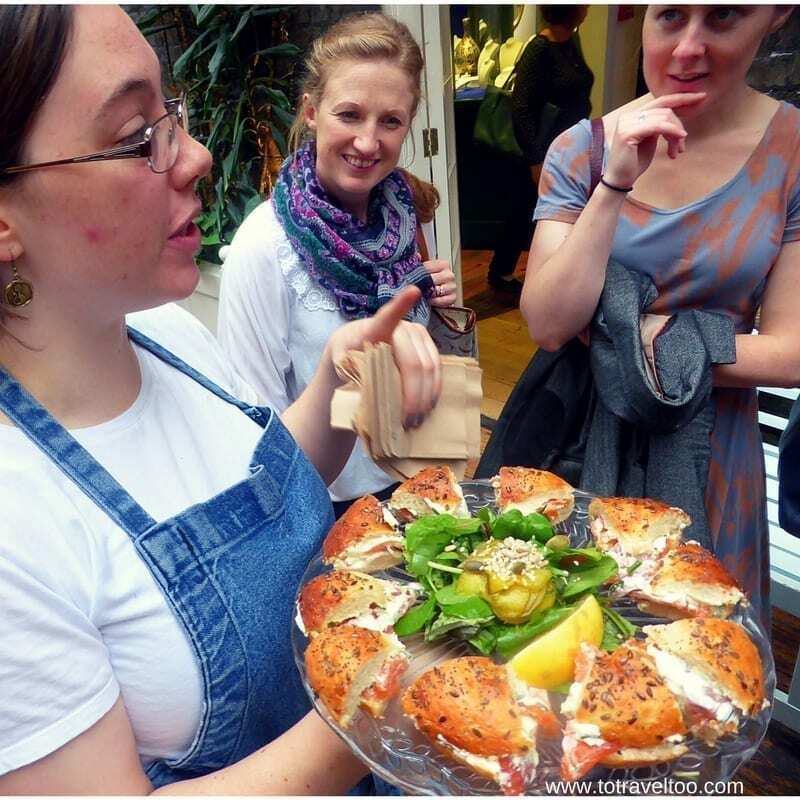 Dublin food tour looks absolutely interesting and I would love to go for it to taste those fresh scones and more. I hope to get some interesting vegan options too. Thanks for your comments.The Food Walking Tour had vegetarian options which was perfect for me. The market was bustling, just how I imagined a Irish market to be like. Wow…what a detailed food guide of Dublin. I am so touched by the story of Caryna. Ireland has that magic spell. From 2 days to have her own shop is quite inspiring. Thank you for the guide. You have no idea how helpful this guide would be as I m planning to visit it soon. Bookmarking it for my visit. Thanks for your comments. I am glad you enjoyed our article. Dublin is a ‘foodies delight’ – you will love it.